Our sculptural expansion facade is locally produced. Take a behind-the-scenes look at its creation. Forty miles north of San Francisco, in the rolling hills just past the upper reaches of the bay, Bill Kreysler shows a visitor around his American Canyon fabrication shop. 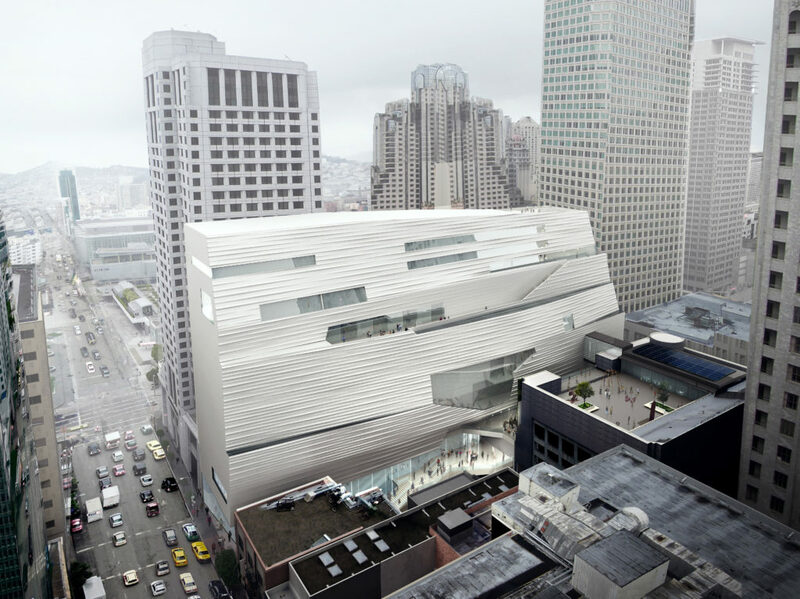 At the entrance is a model of the northeast-facing facade of the expanded SFMOMA. Farther along, in a room with a window overlooking the workshop floor, an architectural drawing of the same facade is pinned to the wall. 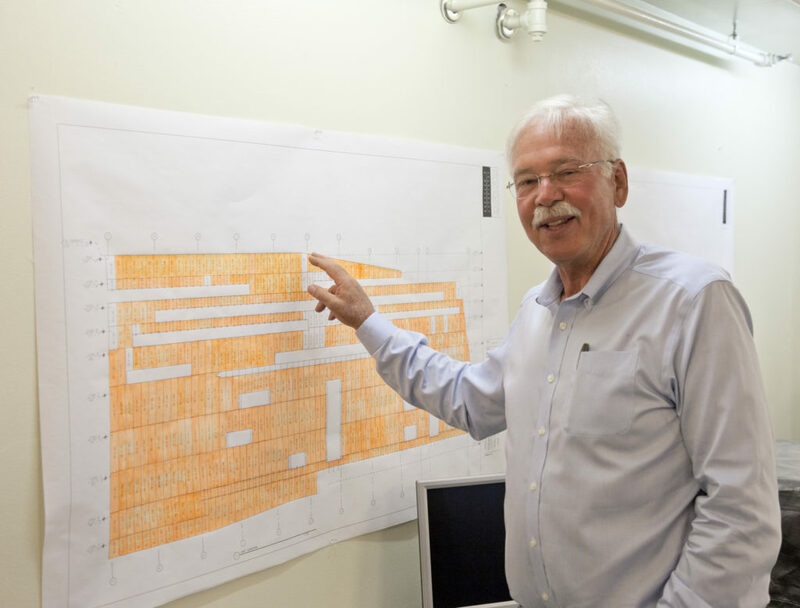 Kreysler points to the numbered, not-so-regular grid that marches across the building face, almost all of which has been neatly highlighted in orange. This is where employees track the progress of the hundreds of panels the factory is fabricating for our new building’s distinctive undulating exterior wall. Kreysler and Associates specializes in using composite materials in architectural applications. Acoustic surfaces for the interior of the Bing Concert Hall on the Stanford University campus were fabricated here, along with the exterior ornament gracing many landmark San Francisco buildings, hardy composite replacing crumbling terra-cotta. 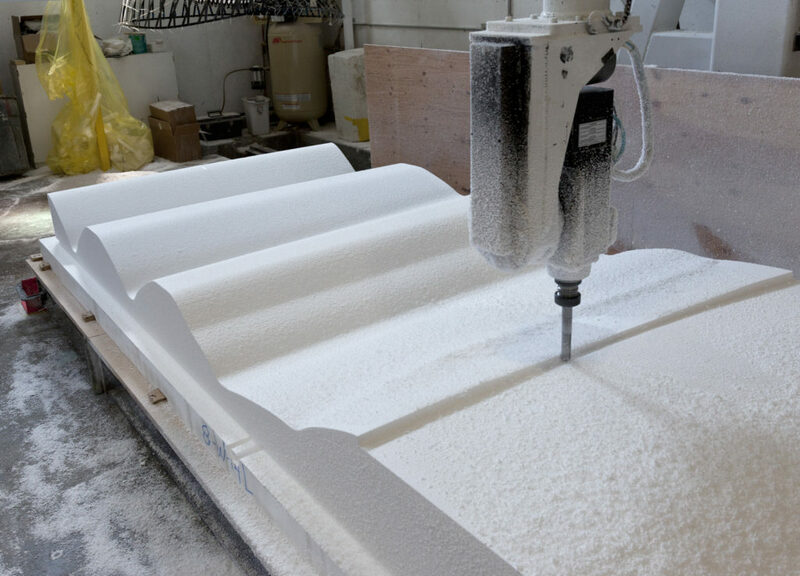 An early pioneer in the use of digital fabrication techniques, the firm also has a long history of working with artists to realize large-scale works from small models. Claes Oldenburg and Coosje van Bruggen’s Cupid’s Span (2002), the cocked bow and arrow plunging into the earth along the San Francisco waterfront, is just one example of the sculptural projects they have helped bring into being since the early 1990s. For SFMOMA, the forty or so employees at Kreysler are translating Snøhetta’s wavelike design into installable parts. The ultra-lightweight cladding panel system the firm has developed for the project brings together an unconventional material and a leading-edge fire-resistant design that makes it possible to use this material on such a large scale for the first time. Not only that, but the production process itself required some ingenuity: Given that each of the 1,400 or so composite panels that make up the facade is different, each panel requires its own mold, a potentially cost-prohibitive proposition. 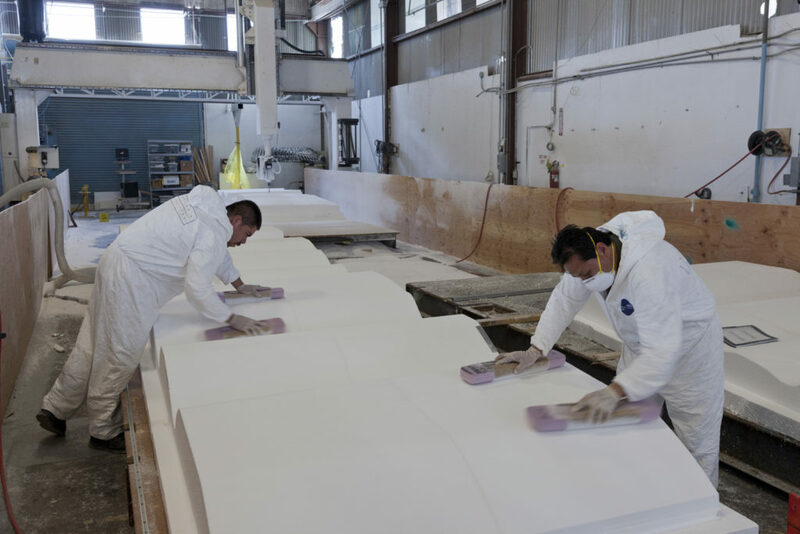 In response, the Kreysler team conceived a process that employs expanded polystyrene to serve as both mold and as protective packaging as the panels are first stored and then transported to the construction site. The tour continues on to the factory floor, where the panels are in production. In one corner of the hangarlike space, the molds are shaped by a computer-guided router, which leaves corrugations that shop workers sand out by hand. Nearby are molds that are ready to go; tin foil and a coating of wax have been applied to them to prevent the composite from sticking, and side plates have been attached to give the panels their depth. 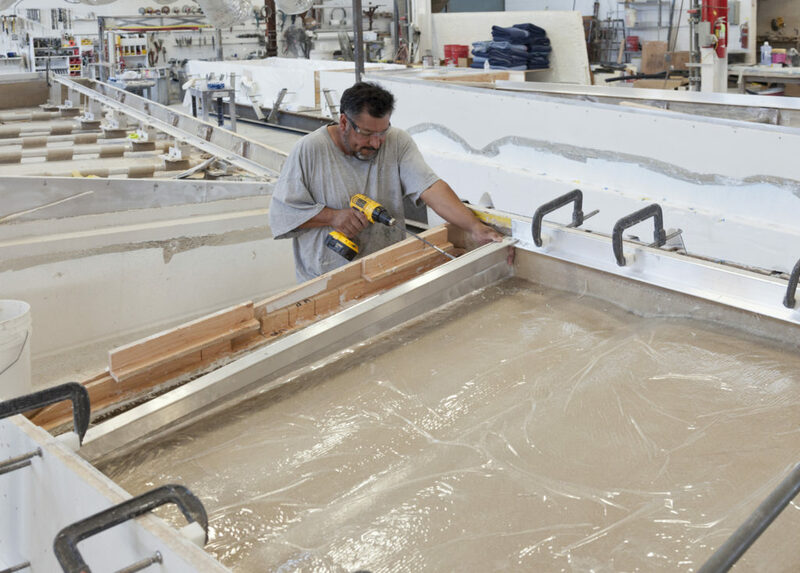 A layer of resin/sand mix goes on first, followed by fiber-reinforced polymer, and that’s it. Together, the two layers measure just 3/16 of an inch thick. Once the composite is properly cured, aluminum tubes are attached to the panel’s hollow back to provide additional stiffening support, and the front surface is sandblasted. This last step removes resin and exposes the sand particles in the top layer of the composite. 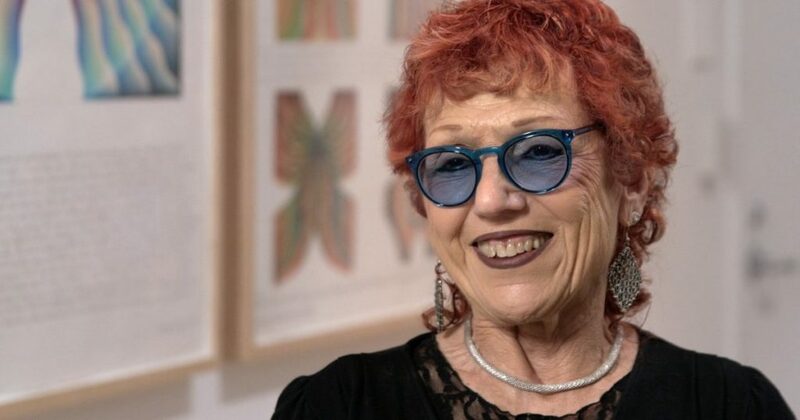 All the sand used in the panels is from Monterey, Kreysler explains — all bought at the same time, from the same place, and mixed before delivery to ensure a consistent color. Outside, a sea of finished panels awaits transport, stacked neatly in piles. 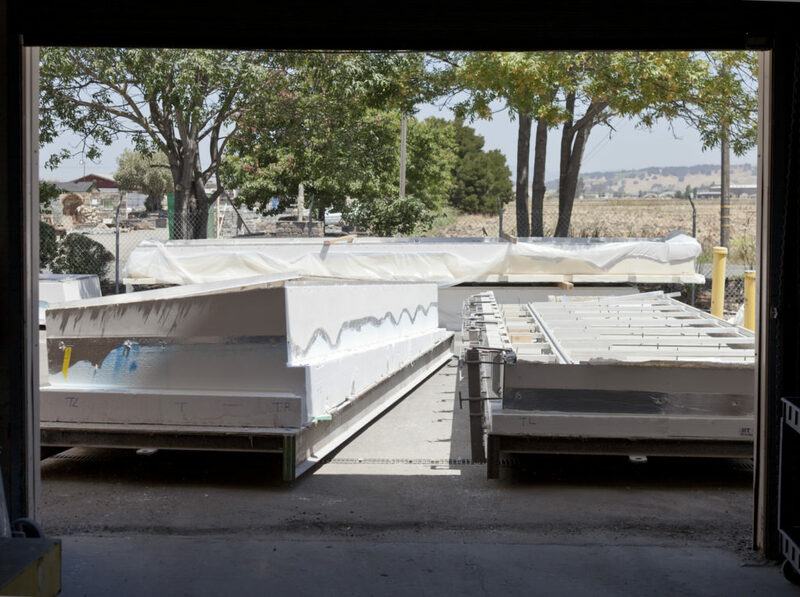 From here, the panels will be carried by truck to Mare Island, near Vallejo, where they will be joined with aluminum backing before being delivered to the site. The polystyrene molds will then head to Fairfield for recycling when their work is done. At a time when building components often arrive on site having traveled halfway around the world, every aspect of these panels is about as local as can be. In September, the last pieces of the facade found their way from the fabrication shop to the Kreysler and Associates yard. At the construction site, installation is already under way. Panel by panel, wave by wave, the rippling surface took shape this fall.